People come back from the dead on soaps all the time. A soap opera coming back from the dead, though, well that is a different story! In 2009, I was given the privilege of reviving the daytime drama Another World (canceled in 1999) as a text and video-based series, www.AnotherWorldToday.com, for the original producers of the show. I was allowed to decide where the characters were ten years later and what happens to them next. 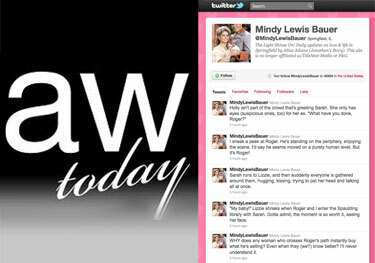 Later that same year, I did the same for the newly canceled Guiding Light via an even more innovative format, Twitter, as one character, Mindy Lewis Bauer, continued sharing the lives and loves of her friends and neighbors with the show's fans. Just like the soaps went from radio to television (and before that serialized novels in magazines by writers like Charles Dickens), the Internet is the next logical step in storytelling's evolution. The medium may change, but my hope is the message will remain the same: Great stories and characters that never end.